First step: Get yourself a good map. I recommend something laminated, like Streetwise Rome. You're going to use this extensively while you plan your trip (reading this site), and while you're in Rome. I find that the most important thing about selecting a hotel in Rome is having an en-suite bathroom! After that, the next most important thing is to select one as close as possible to a Metro (subway) stop. There is so much to see in Rome that you probably won't spend very much time in the hotel, but it's very convenient to be able to stop at the hotel a few times during the day. The Metro is the quickest, most reliable, and least expensive way to get around the city, so I use it often and recommend that you use it as your primary means to get around Rome. Having a hotel near a Metro stop is a welcome thing when feet are sore from a long day of walking. The next most important thing when selecting a hotel is location. In my opinion, the best location in Rome is the Monti neighborhood, near the Colosseum, the Roman Forum, the Imperial Fora, etc. It's great to walk out of your hotel and be at these places in a minute or two, day or night. That means you can finish sightseeing, then go back to the hotel for a while to rest, then go eat supper (anywhere in Rome, assuming you're close to a Metro stop), then go out after dark to walk to all the nearby ancient sights, all lit up real pretty. The hotel I've stayed at that meets all these needs is the Hotel Rosetta. It's very inexpensive, and is a no-frills hotel with a bed, desk, chair, closet, and small bathroom, including shower. But it's clean and friendly, and located on Via Cavour right near Via de Serpente. You can find my December 2, 2012 review of the hotel here. Unfortunately, even in Rome, you need to pay for everything. Italy uses the Euro (€) for its currency instead of the Dollar ($). The nerve. You'll find you need to pay cash much more often than you do in, say, the United States. For example, many restaurants only accept cash. If you exchange your dollars for euros at your bank in the United States, they'll charge you about 7% above the "inter-bank rate", which is the exchange rate shown at xe.com. But if you instead take your ATM card to Italy and use it there, the banks will use that inter-bank rate, plus ATM fees, plus charges your bank imposes. Call your bank and see whether this would be a good deal for you. One of my local banks, for example, would charge me 3% plus $5 plus whatever ATM fees the bank in Rome charges for ATM usage. But an internet bank I also use charges 0% plus $0 (in other words, nothing), and reimburses my account for up to 3 foreign ATM usages per month. So that means I get the xe.com rate for my first 3 ATM withdrawals using that card, and a minimal ATM fee (perhaps €5) for the remaining ones. With 3 ATM withdrawals for the maximum amount permitted per day, I can probably get enough cash to last the entire vacation. To find your maximum ATM withdrawal for a day, find out the dollar amount from your bank, then convert that to Euros at xe.com. That's a savings of 7% from what I'd pay to get that same amount of money exchanged at my bank before I leave for my trip. Plus, I'd be carrying around all that cash for the first part of the vacation. So call the 800 number on the back of your ATM cards and check whether one of them offers good rates. You could save a bunch. You'll also want to carry a credit card for large purchases, such as hotel bills, and perhaps to use at places that accept credit cards. Again, call your credit card companies to find what fees you'll be charged. One of my credit cards charges no fees for international transactions; others charge fees around 3%. The least expensive way to get from Fiumicino Airport (which is also called the Leonardo da Vinci International Airport, since having two different names for the same place is a sure-fire way to confuse tourists and have a little fun) to the center of Rome is by taking the non-stop direct train line named the "Leonardo Express" train. It costs €15 (as of October 2012), takes 30 minutes, and leaves the airport at 7 minutes after the hour and 37 minutes after the hour. From your arrival gate, follow signs to Stazione, with a railway car on them. Buy your ticket from a newsstand or the Biglietteria office or a self-service machine at the platform. The machines are easy to use, and probably your quickest option. Validate your ticket in a yellow machine near the track before you get on the train. Be sure the train you board is headed to Roma Termini. When you get to Termini, you might want to follow the signs to the metro, buy your metro pass at a ticket office or a self-service machine, validate it, and ride the metro to the hotel near a metro stop you selected. Or, if you have heavy luggage and don't want to schlep it up and down the subway escalators (or even worse, the stairs at some stops), you might want to walk out front of the station and take a €10 taxi to your hotel. Or, instead of riding the train from the airport, you could pay €40 (for up to 4 people) for a taxi to the central area of Rome. The ride should take about 40 minutes, and the taxi driver might try to charge you more, or not take you exactly where you want. Be sure to take a taxi that has the "SPQR" shield on the door; others can charge you more than €40. To return from Termini to Fiumicino Airport, the same €15 "Leonardo Express" train can be used. The train leaves at 22 and 52 minutes past each hour. It departs from tracks 25-28. Buy the ticket from a newsstand, or a self-service machine. Validate the ticket at a yellow machine near the track. Termini is bustling with activity. As soon as I got close to the track for the "Leonardo Express", I was met by an energetic young man who offerred to help me to the train. Before I knew what was happening, he walked me over to a tobacco shop to buy my ticket, helped me with my luggage, walked me to the train, validated the ticket for me, and got me on the train. Then he asked for €10 for his services. This was all of about 5 minutes work for him, so I gave him less, but paid him nevertheless. In the future I will avoid this energetic young man. I suppose he could have stolen my luggage or my money, and he really didn't do anything I couldn't have done on my own. 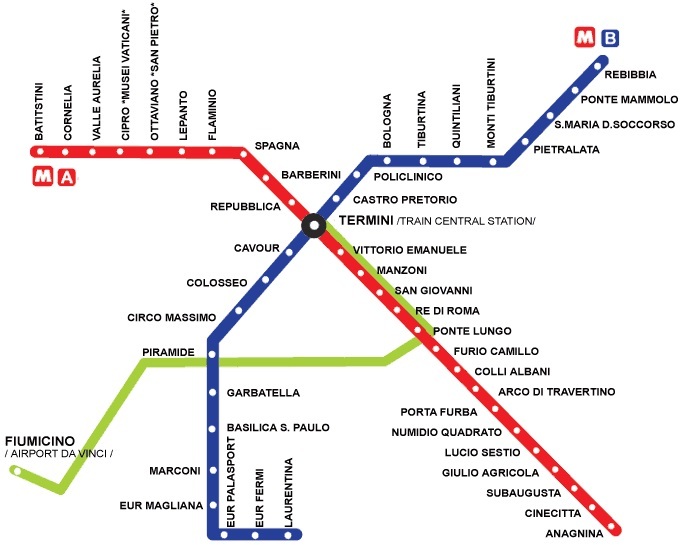 Rome's subway, the Metro (map below), consists of two lines in the shape of the letter 'X'. A third line is under construction but not yet open. The intersection of the two lines is at the Termini train station, the main train station and transportation hub in Rome. There is also a train running between Fiumicino Aiport and Termini, and a few of subway extension lines which go from the main metro lines to the outlying areas (for example, to Ostia Antica). The Red line, line A, runs northwest and southeast from Termini. Northwest (toward Batistini) are the Baths of Diocletian, the Trevi Fountain, the Spanish Steps, Piazza del Popolo and the Vatican. Southeast (toward Anagnina) are the Trophies of Marius, San Giovanni in Laterano and Aqueduct Park. The Blue line, line B, runs southwest and northeast from Termini. Southwest (toward Laurentina) is the Colosseum/Roman Forum/Palatine Hill area, Circus Maximus, the Pyramid of Cestius and the E.U.R. Northeast (toward Rebibbia) is the Ponte Mammolo stop, from which buses to Tivoli depart. When you get onto the Metro, you'll need to select which direction to take the line. The directions are always marked with the name of the last stop on the line. So on the red line, you go toward either Batitstini (northwest) or Anagnina (southeast), and on the blue line, toward Rebibbia (northeast) or Laurentina (southwest). The Metro is pretty reliable, but like everything in Rome, things are on a loose schedule and sometimes things break. For example, during my first-ever day in Rome, the blue line broke, so I had to walk in the heat for an hour rather than take what would have been a 5 or 10 minute ride. This is when you need to throw your arms up, remember how incredibly fortunate you are to be in the eternal city, and shout out how much you love Rome. By the way, the metro never failed me again on that trip. You might notice I never mentioned the Pantheon, Piazza Navona, the Borghese Gallery or the Appian Way in my list of metro stops. That's because you can't cover an entire city with only two lines in the shape of an X. The bus and tram lines fill in the rest of area with public transportation. Luckily, the Metro, bus and tram system is run by one organization, ATAC. This lets you buy individual ride tickets which let you take a metro for several stops then a bus to your destination, or daily, 3-day or weekly passes which let you ride unlimited for that period of time. I find these passes the best way to go because I rely heavily on public transportation when I'm in Rome. A single ride costs €1.50, an all-day pass costs €6.00, a 3-day pass costs €16.50 and a 7-day pass costs €24 (prices are as of October 2013). The 7-day pass costs the same as 16 trips, and I can easily average 3 trips per day on the Metro, so the pass is a good savings for me. With a weekly pass I don't need to worry about taking extra trips, or wasting time buying individual tickets before each ride. I've always gotten my money's worth using a 3-day or 7-day pass. A multiple ride pass always needs to be 'validated' before its first use - this indicates when the pass was first used, therefore when it expires. Validation of the pass is automatic when you use the Metro (the subway). The machine you put your ticket in automatically recognizes its first use and validates it for you. If you use a pass for the first time (or even a single-ride ticket) on a bus, be sure to put it into the yellow machine on the bus to validate it. After that first validation, you don't need to validate the ticket again -- the date / time it was first used is stamped on the ticket, so it is easily to determine when the ticket expires. Security personnel spot-check tickets on buses and trams. If you're caught with an unvalidated ticket, or an expired ticket, there is a hefty fine. So be sure to carry a validated ticket that hasn't yet expired whenever you use public transit in Rome so you can prove you've paid properly for the ride. Maps of the bus routes can be easily downloaded as PDF files. Just go to www.atac.roma.it, follow the 'linee e mappe' link, and grab the 'centro' and 'citta' maps into your mobile device so you can have them handy. The maps show the bus routes, with the route numbers along the routes. Arrows on the map indicate the direction of the buses; no arrow indicates the bus goes both directions. Along the route, at the bus stops (fermata), you'll find a sign like the one below. The name of the stop is shown at the top of the sign (Fori Impariali, in this case). Beneath that are the route numbers that stop here (186, 271, 571 and 810). The stops along the route are listed below the route number with the direction of the bus indicated beside the route number. So the stops listed in the direction of the arrow from the stop where you stand are the remaining stops on this route. For example, from here, Bus 810 will go to Plebiscito, Via Torre Argentina, Botteghe Oscure, Ara Coeli, and end at Piazza Venezia. 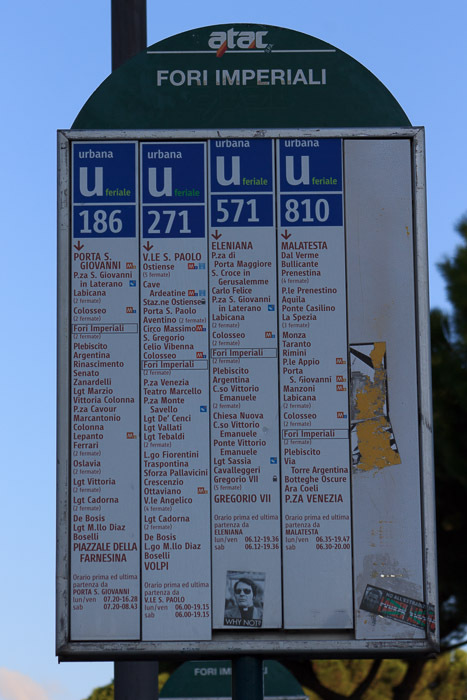 More information about public transportation in Rome can be found here. It gets very hot in Rome. Thus far I've always gone during late September thru early November, and I've still had plenty of hot days even though I've avoided the really really hot months of June, July and August. I learned to always carry an empty water bottle to start the day. I like the collapsible ones like this one. It doesn't have to be big at all. By about 10 or 11 AM I can feel it getting warmer, and before it gets really hot I fill the water bottle at one of the many public drinking fountains in Rome (1st photo below). They're everywhere. You have to be careful not to trip over them. Well, that might be a slight exhaggeration, but you will find one every few blocks. All of these small drinking fountains, and all of the prettier flashy fountains (lots are listed on the main Tourist in Rome page) are safe to drink from. 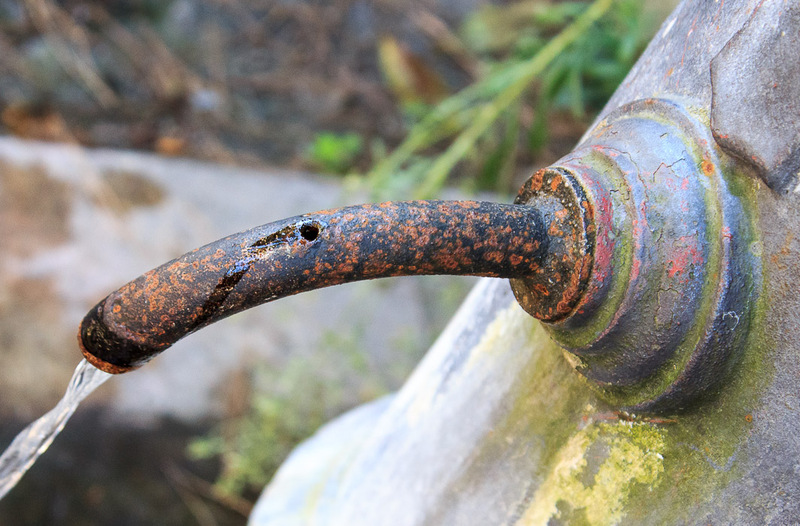 Just be sure to take your water from the water pipe, not dip it in a trough or a pool where water has been collected and standing and can become dirty. To drink directly out of one of those public drinking fountains, notice the hole on the top of the water pipe (1st photo below, small black hole). Cover the end of the water pipe with your finger and a small powerful stream of water will come out of that hole on the top of the water pipe (2nd photo below). It's easy to drink from the stream from that top hole. 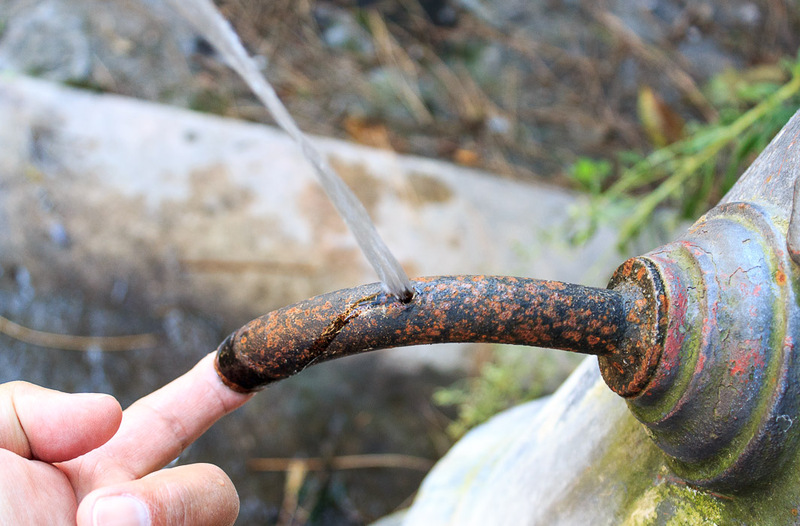 Just adjust your finger so the stream is a convenient intensity, and grab a cool drink of fresh, safe water. Just be sure your camera doesn't bang into the pipe while you're drinking. 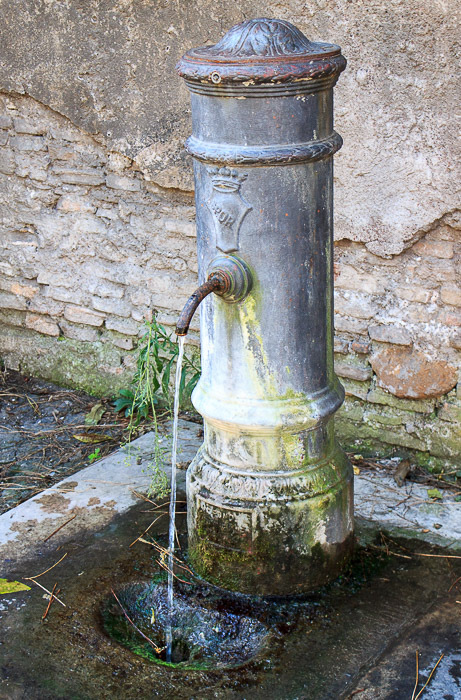 I've done this daily for 6 weeks of my life (my days in Rome), and filled my water bottle a couple times nearly each day from these fountains, and I've never had any health problem from it. It really is safe. All the tourbooks and web sites warn that pick-pockets are rampant in Rome. They'll accost you on busses, on the subway, as you're waiting in line at the Colosseum, and as you walk through Termini. They're especially prevalent on bus routes 64 and 40, since those are heavily used by tourists. They cleverly work in pairs or groups, with one person distracting you while another picks your pocket. A crowded bus or subway train makes it easy since you're continuously getting bumped, so you won't even notice someone taking advantage of one of those bumps to pull your wallet out of your pocket. I've even read that they'll slash the bottom of your backpack with a knife and run off with the stuff that falls out the bottom. I suppose this is all true, but during my trips to Rome (admittedly, only 24 days of time), I never had an incident or saw one. However, I was careful to not advertise that I had anything expensive (kept it all in an unmarked backpack, not a "Canon" camera bag), I took my backpack off my back and carried it in front of me when I was in a situation I'd read warnings about, and I kept my passport and most of my money in a money belt under my clothes. I just kept cash for the next few hours and one credit card in my front, not back, pocket. Maybe those precautions were sufficient; maybe I was just lucky. I hope you're lucky, too. The Roma Pass can be purchased for €34 (all prices in this section are as of Sept 2013). It gives you a 3-day transit pass (worth €16.50), gets you into your first two sites for free (if you select the Colosseum/RomanForum/Palatine Hill and the Capitoline Museum, that's worth €15.50 and €13), and gets you about €2 or €3 off other sites for 3 days from the first use of the pass. The pass is usable at the sites listed on the Roma Pass web site, but they do not include the Vatican Museum. An added benefit of the Roma Pass is that you don't have to wait in the long ticket lines and entrance lines at the Colosseum -- this saves you about an hour of your time. So you pay €34 for, perhaps €50 of benefit. Sounds like a no-brainer, right? Not so fast. If you'd bought a 7-day transit pass, the cost would be €24, so the 3 days of transit pass you get are really only worth €10.50, not €16.50, so the total benefit is now €44. And what if you've been to the Colosseum, and plan to use the Roma Pass at the Borghese Gallery (€11) and the Museum of Imperial Forums (€11). Now your value is €37.50, just a little more than the €34 cost. So you need to be careful and consider what you plan to use the pass for, how much you can see in the 3 days the pass is valid, how much you'll use public transit during those 3 days (remember a single ride costs only €1.50), etc. However, if you're going to see the Colosseum and the Capitoline Museum (two of the more expensive attractions, located very near each other), and you're not going to be in Rome for long enough to take advantage of a 7-day transit pass, and you plan to use public transportation a lot during those 3 days, then I think the Roma Pass is a great deal. And be sure to follow the dress code to be sure you can gain entry into the churches you visit. This means that for Catholic churches, like St. Peter's Basilica, as well as the Vatican Museum and the St. Peter's Basilica Dome Walk, you can have no bare shoulders or knees, which means that no shorts are permitted. I carried a pair of lightweight nylon pants to slip over my shorts. This dress code is officially in force at the other major Catholic churches throughout Rome, but I never saw it enforced anywhere else in my (admittedly limited) experience. Most museums stop permitting entry one hour before closing, under the assumption that you'll need at least an hour to see the museum. Don't bother going during that last hour they're open; you probably won't get in. Also to avoid wasting time, I encourage you to visit the official web site of the sites you select to see during your trip, so you can verify their open hours and days. Some sites are closed on particular holidays, and of course, hours and prices of sites might have changed since I gathered my information. Sometimes you just need to get to the other side. When this happens in Rome, you are supposed to just start walking out into the street, don't bother looking, and don't stop once you start. Sounds terrifyingly stupid, eh? But it seems to work (although I don't skip the looking part). Apparently, if you wait to cross until the drivers stop for you, they'll never stop, and since there's quite a bit of traffic in Rome, you might never get the chance to cross the street. But if you walk out into the road, they'll slow down sufficiently for you to cross in front of them. Use this information at your own risk, but I have found it to be true (but then, I always look first). More on this is on this page and also this page. If you like classical music, you need to put Respighi's Roman Trilogy on your iPod for a trip to Rome. This lushly orchestrated set of three four-movement tone poems features Ottorino Respighi's evocations of twelve places in or near Rome, 4 places per poem. The three tone poems, and their year of composition are The Fountains of Rome (Fontane di Roma), 1915, The Pines of Rome (Pini di Roma), 1924, and Roman Festivals (Feste Romane), 1928. However, I think the best order to listen to them in is Festivals, Fountains, then Pines. Together, they're about 1 hour long. I recommend most highly the performance by the Orchestra dell'Accademia Nazionale di Santa Cecilia (Rome), conducted by Daniele Gatti, recorded Oct 14-16 1996, on Conifer 75605 51292 2. Second best is the Boston Symphony Orchestra, conducted by Seiji Ozawa, on DG 415 846-2. Circuses (Circenses), which brings to life the cruel games in the Circus Maximus in imperial times. A threatening sky hangs over the Circus Maximus, but it is the people's holiday: "Ave Nero!" The iron doors are unlocked, the strains of a religious song and the howling of wild beasts float on the air. The crowd rises in agitation: unperturbed, the song of the martyrs develops, conquers, and is lost in the tumult. A walk inside the ancient Circus Maximus is the perfect time to listen to this music, which indeed sounds like what we might imagine the chaos and hype associated with the games to have sounded like. The Jubilee (Il giubileo), in which pilgrims during the Middle Ages walk along the highway, praying. There finally appears from the summit of Monte Mario, to ardent eyes and gasping souls, the holy city: "Rome! Rome!" A hymn of praise bursts forth, the churches ring out their reply. Monte Mario is a little over 1 mile north from the Cipro metro stop. The October Festival (L'ottobrata) describes the popular autumnal festival called the October Festival, in Roman Castelli covered with vines, with its echoes of hunting, tinkling of bells, and songs of love which arise in a romantic serenade. Castelli Romani is a generic name for the hills outside of Rome. The Epiphany (La Befana) evokes the traditional festival on the night of January 6th, the night before Epiphany, in the Piazza Navona. A characteristic rhythm of trumpets dominates the frantic clamor. Above the swelling noise float, from time to time, rustic motives, saltarello cadenzas, the strains of a barrel-organ of a booth and the appeal of the proclaimer, the harsh song of the intoxicated and the lively stornello in which is expressed the popular feelings. "Lasstece pass! Semo Romani!" ("We are Romans! Let us pass!"). The Triton Fountain in the Morning (La fontana del Tritone al mattino) begins with blasts of horns and trills from the orchestra, conjuring up the image of joyful tritons and water-nymphs mingling and splashing at the Triton Fountain. Wow, when you listen to this at the Triton Fountain (in the morning, if you can), you'll hear that Respighi absolutely nailed this fountain. First the Triton blows his conch shell, then the water splashes over the edges of the huge shell in the morning sunshine! The sounds describe the fountain beautifully. The Trevi Fountain at Mid-Day (La fontana di Trevi al meriggio), with a solemn theme, changes into a triumphal character depicting Oceanus' chariot passing across the water, drawn by seahorses, followed by tritons and sirens. The Villa Medici Fountain at Sunset (La fontana di Villa Medici al tramonto), in which birds sing and bells toll to close the day at the Fountain at Villa Medici. I can vouch that the superb views over Rome from this spot, and the lack of traffic and noise indeed justify this vision of a peaceful end of a day painted in sound by Respighi. Just go there and listen to this music. The Pines of the Villa Borghese (I pini di Villa Borghese) captures the energy and irreverence of children at play in the Villa Borghese, including a discordant trumpet "raspberry" towards the end. Pines Near a Catacomb (I pini presso una catacomba) presents the meditative mood near a catacomb, maybe it's the Catacombs of San Callisto on the Appian Way. The Pines of the Janiculum (I pini del Gianicolo) is probably my favorite movement, a beautiful slow nocturne evoking the view over Rome from the Janiculum (Giancolo) Hill, south of the Vatican. The recorded sound of a nightingale near the end is one of the first instances where a recorded sound is specified for a concert score. What a spectacular view of Rome this hill provides! As I stood there under those pines overlooking the Eternal City listening to this music, I reflected on the stately serenity of these pines, watching Rome through its ages of conquest, religion, poverty and recovery. The Pines of the Appian Way (I pini della Via Appia) transforms the mood of the previous movement into a long crescendo which becomes a loud, exciting march that evokes Ancient Rome, a triumph heading back to Rome from the Provinces, its one-time world dominance. What an incredible ending to these paintings of Rome!